Hypervariable regions of the genome contain extreme levels of polymorphism and genetic variation. Hypervariable regions include the D-loop of mitochondrial DNA, the human leukocyte antigen (HLA) gene family of the major histocompatibility complex, and the RNA of retroviruses such as the human immunodeficiency virus (HIV) and the hepatitis C virus (HCV). 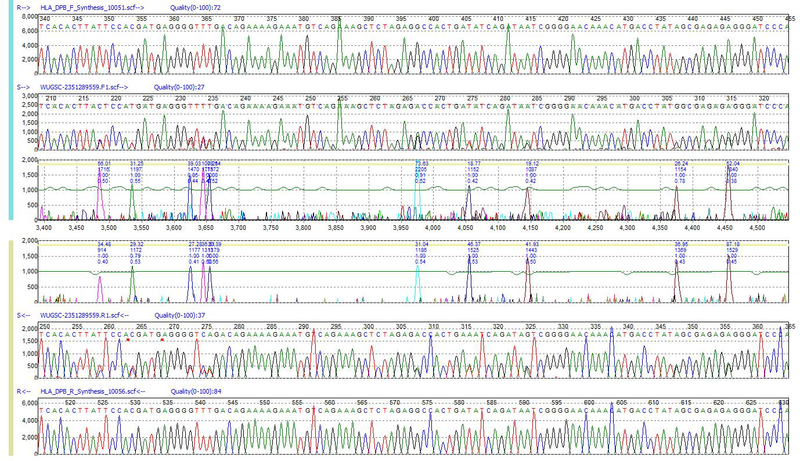 Sanger sequencing projects involving a high level of variability demand fully automated calls of single nucleotide polymorphisms (SNPs), low frequency variants (somatic, mosaic, heteroplasmy) and homozygous and heterozygous insertions, deletions, and duplications (INDELS) to identify variants between strains. Mutation Surveyor software's patented anti-correlation technology performs a physical trace to trace comparison of hypervariable sequences to a reference trace in order to detect sequence variants. The software is perfect for the analysis of hypervariable regions, offering accuracy greater than 99% in the bidirectional analysis mode and sensitivity down to 5% primary peak using Phred 20 bidirectional sequence data. HLA-DPB1 sample showing a high frequency of mutations when compared to the reference trace. The mutation electropherograms display mutations based on the level of correlation between sample and reference trace.